eDB360 meets eAdam 3.0 – when two heads are better than one! Version v1711 of eDB360 invites eAdam 3.0 to the party. What does it mean? We recently learned that eDB360 v1706 introduced the eDB360 repository, which materialized the content of 26 core DBA_HIST views into a staging repository made of heap tables. This in order to expedite the execution of eDB360 on a database with an enlarged AWR. New version v1711 expands the list from 26 views to a total of 219. And these 219 views include now DBA_HIST, DBA, GV$ and V$. Expanding existing eDB360 repository 8.4x from 26 to 219 views is not what is key on version v1710. The real impact of the latest version of eDB360 is that now it benefits of eAdam 3.0, providing the same benefits of the 219 views of the eDB360 heap-tables repository, but using External Tables, which are easily transported from a source database to a target database. This simple fact opens many doors. Using the eAdam 3.0 repository from eDB360, we can now extract the metadata from a production database, then restore it on a staging database where we can produce the eDB360 report for the source database. We could also use this new external repository for: finer-granularity data mining; capacity planning; sizing for potential hardware refresh; provisioning tools; to estimate candidate segments for partitioning or for offloading into Hadoop; etc. With the new external-tables eAdam 3.0 repository, we could easily build a permanent larger heap-table permanent repository for multiple databases (multiple tenants), or for multiple time versions of the same database. Thus, now that eDB360 has met eAdam 3.0, the combination of these two enables multiple innovative future features (custom or to be packaged and shipped with eDB360). eDB360 is a free tool that gives a 360-degree view of an Oracle database. It installs nothing on the database, and it runs on 10g to 12c Oracle databases. It is designed for Linux and UNIX, but runs well on Windows as well (you may want to install first UNIX Utilities UnxUtils and a zip program, else a few OS commands may not properly work on Windows). This repository-less version is the default way to use eDB360, and is the right method for most cases. But now, in addition to the default use, eDB360 can also make use of one of two repositories. eDB360 takes time to execute (several hours). It is designed to time-out after 24 hours by default. First reason for long execution times is the intentional serial-processing method used, with sequential execution of query after query, while consuming little resources. Such serial execution, plus the fact that it is common to have the tool execute on large databases where the state of AWR is suboptimal, causes the execution to take long. We often discover that source AWR repositories lack expected partitioning, and in many cases they hold years of data instead of expected 8 to 31 days. Therefore, the nature of serial-execution combined with enlarged and suboptimal AWR repositories, usually cause eDB360 to execute for many hours more than expected. With 8 to 31 days of AWR data, and when such reasonable history is well partitioned, eDB360 usually executes in less than 6 hours. eDB360 repository: Use this method to create a staging repository based on heap tables inside the source database. This method helps to expedite the execution of eDB360 by at least 10x. Repository heap-tables are created and consumed inside the same database. eAdam3 repository: Use this method to generate a repository based on external tables on the source database. Such external-tables repository can be moved easily to a remote target system, allowing to efficiently generate the eDB360 report there. This method helps to reduce computations in the source database, and enables potential data mining on the external repository without any resources impact on the source database. This method also helps to build other functions on top of the 219-tables repository. Both repositories are implemented under the edb360-master/repo subdirectory. Each has a readme file, which explains how to create the repository, consume it and drop it. The eAdam3 repository also includes instructions how to clone an external-table-based eAdam repository into a heap-table-based eDB360 repository. Executing eDB360 on the eDB360 repository is faster than executing it on the eAdam3 repository, while avoiding new bug 25802477. This new Oracle database bug inflicts compressed external-tables like the ones used by the eAdam3 repository. If you use eDB360 or eAdam3 repositories and have questions or concerns, do not hesitate to contact the author. Reducing the scope of eDB360 is now possible without having to generate a custom configuration file. Prior to this version, if a user wanted to generate output for let’s say AWR reports only (section 7a), the tool needed a custom.sql file with line DEF edb360_sections = ‘7a’;. Then we would pass to edb360.sql as 2nd execution parameter the name of this custom configuration file (too cumbersome!). Starting on v1708, we can directly pass to edb360.sql the section that we desire (i.e. SQL> @edb360 T 7a). This 2nd parameter can either input the name of a custom configuration file (legacy functionality), but now it also accepts a column, a section, a list of columns or a list of sections; for example: 7a, 7, 7a-7b, 1-4 and 3 are all valid values. A couple of reports were added to section 3h: “SQL in logon storms” and “SQL executed row-by-row”. The former identifies those SQL statements that are seen frequently on very short-lived sessions (based on ASH), and the latter presents a list of SQL statements with large number of executions and small number of rows processed. eDB360 now extracts ASH from eAdam for top 16 SQL_ID (as per SQLd360 list) + top 12 SNAP_ID (as per AWR MAX from column 7a). What it means is that eDB360 includes now a tar file with raw ASH data for both: SQL statements of interest and for AWR periods of interest (both according to what eDB360 considers important). Using eAdam is easy, so when content of eDB360 does not include a very specific aggregation of ASH data that we need, or when we have to understand the sequence of some ASH samples for example, we can then restore this eAdam data on any Oracle database and data mine it. Some reports on section 2b show now totals at the bottom. That is to SUM some numeric values. Other reports may follow in future releases. RMAN section includes now a new report “Blocks with Corruption or Non-logged”. Added Load Profile (Per Sec, Per Txn and Count) as per DBA_HIST_SYSMETRIC_SUMMARY. This Load Profile resembles what we see on AWR at the top, but this is computed for the entire period of diagnostics (31 days by default). It shows max values, average, median and several percentiles. With this new report on section 1a, we can glance over it and discover in minutes some areas of further interest, for example: logons per second too high, just to mention one. There is a new section 4i with “Waits Count v.s. Average Latency for top 24 Wait Events”. With this set of 24 reports (one for each of the top wait events) we can observe if patterns on the number of counts relate to patterns on the latency for such wait event; for example we are able to see if an increase in the number of waits for db file sequential reads correlates to an increase of average latency for such wait event. We can also observe cases were latency for a wait event cannot be explained by load on current database, thus hinting an external influence. Fixed “ORA-01476: divisor is equal to zero” on planx at DBA_HIST_SQLSTAT. Added AWR DIFF reports for RAC and per instance. These are computed comparing MAX reports to MEDIAN reports, and they help to quickly identify large differences on load. These new AWR DIFF reports are regulated by configuration parameter edb360_conf_incl_addm_rpt (enabled by default). They exist on 11R2 and higher. Added the ASH Analytics Active report for 12c. This new ASH report is regulated by configuration parameter edb360_conf_incl_ash_analy_rpt (enabled by default). This applies to 12c and higher. The name of the database is now part of the main filename. Some users requested to include this database name as part of the main zip file since they are using eDB360 periodically on several databases. This new feature is regulated by configuration parameter edb360_conf_incl_dbname_file (disabled by default). At completion, main eDB360 zip file can now by automatically moved to a location other than the standard SQL*Plus working directory. All output files are still generated on the local SQL*Plus directory from where the script edb360.sql is executed (i.e. edb360-master directory), but at the completion of the execution the consolidated output zip file is now moved to a location specified by a new parameter. This new feature is regulated by configuration parameter edb360_move_directory (disabled by default). Added new report on “Database and Schema Triggers” under column 3h. This new report can be used to see potential LOGON or other global triggers. For triggers on specific tables, refer to SQLd360 which is automatically included on eDB360 for top SQL. All queries executed by eDB360 to generate its output were modified. New format is q'[query]’. Reason for this change is to improve readability of the code. Always download and use the latest version of this tool. For questions or feedback email me. And I hope you get to enjoy eDB360 as much as I do! During my 17 years at Oracle, I developed several tools and scripts. The largest and more widely used is SQLTXPLAIN. It is available through My Oracle Support (MOS) under document_id 215187.1. SQLTXPLAIN, also know as SQLT, is a tool for SQL diagnostics, including Performance and Wrong Results. I am the original developer and author, but since very early stages of its development, this tool encapsulates the expertise of many bright engineers, DBAs, developers and others, who constantly helped to improve this tool on every new release by providing valuable feedback. SQLT is then nothing but the collection of many good ideas from many people. I was just the lucky guy that decided to build something useful for the Oracle SQL tuning community. When I decided to join Enkitec back on 2013, I asked Mauro Pagano to look after my baby (I mean SQLT), and sure enough he did an excellent job. Mauro fixed most of my bugs, as he jokes about, and also incorporated some of his own :-). Mauro kept SQLT in good shape and he was able to continue improving it on every new release. Now Mauro also works for Enkitec, so SQLT has a new owner and custodian at Oracle. Abel Macias is the new owner of SQLT, and as such he gets busy maintaining and enhancing this tool among other duties at Oracle. So, if you have enhancement requests, or positive feedback, please reach out to Abel at his Oracle account: abel.macias@oracle.com. If you come across some of my other tools and scripts, and they show my former Oracle account (carlos.sierra@oracle.com), please reach out to Abel and he might be able to route your concern or question. Since one of my hobbies is to build free software that I also consume, my current efforts are on eDB360, eAdam and eSP. The most popular and openly available is eDB360, which basically gives your a 360-degree view of a database without installing anything. Then, Mauro is also building something cool on his own free time. Mauro is building the new SQLd360 tool, which is already available on the web (search for SQLd360). This SQLd360 tool, similar to eDB360, provides a 360-degree view, but instead of a database its focus is one SQL. And similarly than eDB360 it installs nothing on the database. Both are available as “free software” for anyone to download and use. That is the nice part: everyone likes free! (specially if any good). What is the difference between SQLd360 and SQLT? SQLT has it all. It is huge and it covers pretty much all corners. So, for SQL Tuning this SQLTXPLAIN is “THE” tool. SQLd360 in the other hand is smaller, newer and faster to execute. It gives me what is more important and most commonly used. SQLT requires to install a couple of schemas and hundreds of objects. SQLd360 installs nothing! To download SQLT you need to login into MOS. In contrast, SQLd360 is wide open (free software license), and no login is needed. Oracle Support requires SQLT, and Oracle Engineers are not exposed yet to SQLd360. SQLd360 uses Google charts (as well as eDB360 does) which enhance readability of large data sets, like time series for example. Thus SQLd360 output is quite readable. eDB360 calls SQLd360 on SQL of interest (large database consumers), so in that sense SQLd360 enhances eDB360. But SQLd360 can also be used stand-alone. If you ask me which one would I recommend, I would answer: both!. If you can use both, then that is better than using just one. Each of these two tools (SQLT and SQLd360) has pros and cons compared to the other. But at the end both are great tools. And thanks to Abel Macias, SQLT continues its lifecycle with frequent enhancements. And thanks to Mauro, we have now a new kid on the block! I would say we have a win-win for our large Oracle community! 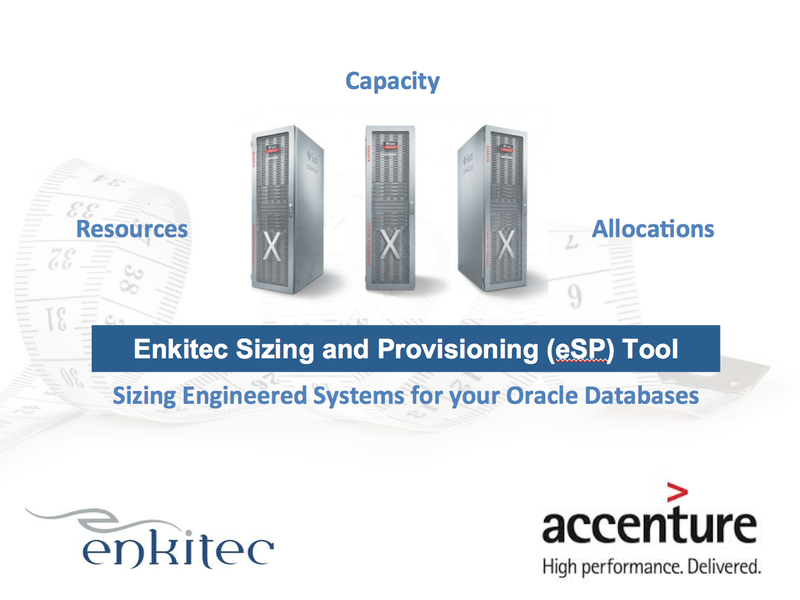 Enkitec’s Sizing and Provisioning (eSP) is a new internal tool designed and developed with Oracle Engineered Systems in mind. Thanks to the experience and insights from Randy Johnson, Karl Arao and Frits Hoogland, what began as a pet project for some of us, over time became an actual robust APEX/PLSQL application, developed by Christoph Ruepprich and myself, and ready to debut at Oracle Open World 2014. This posting is about eSP, what it does, and how it helps on the sizing and provisioning of Oracle Engineered System, or I would rather say, any System where Oracle runs. We used to size Engineered Systems using a complex and very useful spread sheet developed by Randy Johnson and Karl Arao. Now, it is the turn for eSP to take the next step, and move this effort forward into a more scalable application that sits on top of one of our Exadata machines. Sizing a System can be quite challenging, especially when the current system is composed of several hosts with multiple databases of diverse use, size, versions, workloads, etc. The new target system may also bring some complexities; as the number of possible configurations grows, finding the right choice becomes harder. Then we also have the challenge of disk redundancy, recovery areas, the potential benefits of offloading with their smart scans, just to mention some added complexities. At a very high level, Sizing a System is about 3 entities: Resources, Capacity and Utilization. Resources define what I call “demand”, which is basically the set of computational resources from your original System made of one or many databases and instances over some hosts. Capacity, which I also call it “supply”, is the set of possible target Systems with their multiple Configurations, in other words Engineered Systems, or any other hardware capable to host Oracle databases. Utilization, which I may also refer as “allocation” is where the magic and challenge resides. It is a clever and unbiassed mapping between databases and configurations, then between instances and nodes. This mapping has to consider at the very least CPU footprint, Memory for SGA and PGA, database disk space, and throughput in terms of IOPS and MBPS. Additional constraints, as mentioned before, include redundancy and offloading among others. CPU can be a bit tricky since each CPU make and model has its own characteristics, so mapping them requires the use of SPEC. Other challenge a Sizing tool has to consider is the variability of the Resources. The question becomes: Do we see the Resources as a worst case scenario, or shall we rather consider them as time series? In other words, do we compute and use peaks, or do we observe the use of Resources over time, then develop some methods to aggregate them consistently as time series? If we decide to use a reduced set of data points, do we use peaks or percentiles? if the latter, which percentile is well balanced? 99.9, 99, 95 or maybe 90? How conservative are those values? There are so many questions and the answer for most of them, as you may guess is: “it all depends”. 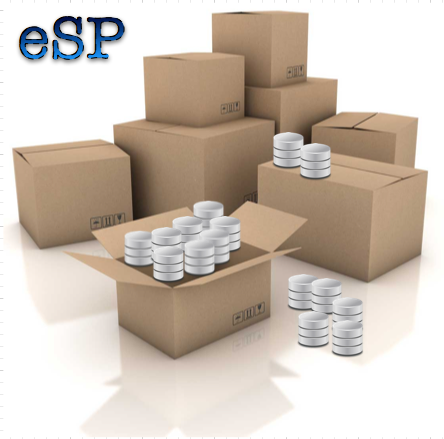 Without getting into the technical details, I can say that eSP is an APEX application with a repository on an Oracle database, which inputs collected “Requirements” from the databases to be sized, then it processes these Requirements and prepares them to be “Allocated” into one or more defined hardware configurations. The process is for the most part “automated”, meaning this: we execute some tool or script in the set of hosts where the databases reside, then upload the output of these collectors into eSP and we are ready to Plan and apply “what-if” scenarios. Having an Exadata System as our work engine, it allows this eSP application to scale quite well. A “what-if” scenario takes as long as it takes to navigate APEX pages,while all the computations are done in sub-seconds behind scenes, thanks to Exadata! Once we load the Resources from the eSP collector script, or from the eAdam tool, we can start playing with the metadata. Since eSP’s set of known Configurations (Capacity) include current Engineered Systems (X4), allocating Configurations is a matter of seconds, then mapping databases and instances becomes the next step. eSP contains an auto “allocate” algorithm for databases and instances, where we can choose between a “balanced” allocation or one that is “dense” with several density factors to choose from (100%, 90%, 80%, 70%, 60% and 50%). With all these automated options, we can try multiple sizing and allocation possibilities in seconds, regardless if we are Sizing and Provisioning for one database or a hundred of them. The Enkitec’s Sizing and Provisioning (eSP) tool is an internal application that we created to help our customers to Size their next System or Systems in a sensible manner. The methods we implemented are transparent and unbiassed. We are bringing eSP to Oracle Open World 2014. I will personally demo eSP at our assigned booth, which is #111 at the Moscone South. I will be on and off the booth, so if you are interested on a demo please let me know, or contact your Enkitec/Accenture representative. We do prefer appointments, but walk-ins are welcomed. Hope to see you at OOW! Performance Metrics are easier to digest if visualized trough some Line Charts. OEM, eDB360, eAdam and other tools use them. If you already have a SQL Statement that provides the Performance Metrics you care about, and just need to generate a Line Chart for them, you can easily create a CSV file and open it with MS-Excel. But if you want to build an HTML Report out of your SQL, that is a bit harder, unless you use existing technologies. 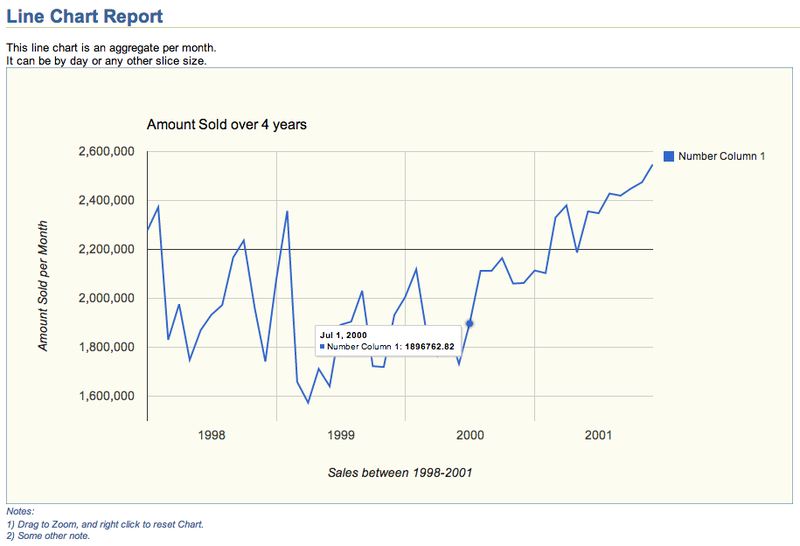 Tools like eDB360 and eAdam use Google Charts as a mechanism to easily generate such Charts. A peer asked me if we could have such functionality stand-alone, and that challenged me to create and share it. This HTML Line Chart Report above was created with script line_chart.sql shown below. The actual chart, which includes Zoom functionality on HTML can be downloaded from this Dropbox location. Feel free to use this line_chart.sql script as a template to display your Performance Metrics. It can display several series into one Chart (example above shows only one), and by reviewing code below you will find out how easy it is to adjust to your own needs. Chart above was created using a simple query against the Oracle Sample Schema SH, but the actual use could be Performance Metrics or any other Application time series. eAdam is a free tool that extracts a subset of data and metadata from an Oracle database with the objective to perform some data mining using a separate staging Oracle database. The data extracted is relevant to Performance Evaluations projects. Most of the data eAdam extracts is licensed by Oracle under the Diagnostics Pack, and some under the Tuning Pack. Therefore, in order to use this eAdam tool, the source database must be licensed to use both Oracle Packs (Tuning and Diagnostics). To a point, eAdam is similar to eDB360; both access the Data Dictionary in order to produce some reports. The key difference is that eDB360 generates all the reports (after doing some intensive processing) at the source database, while eAdam simply extracts a set of flat files into a TAR file, using a very light-weight script, delaying all the intensive processing for a later time and on a separate staging system. This feature can be very attractive for busy systems where the amount of processing of any external monitoring tool needs to be minimized. On the source system, eAdam only needs to execute a short script to extract the data and metadata of interest, producing a dense TAR file. On a staging system, eAdam does the heavy lifting, requiring the creation of a repository, the load of this repository and finally the computation of meaningful reports. The processing of the TAR file into the staging system is usually performed by the requestor, using a lower-level database, or a remote one. eAdam works on 10gR2, 11gR2, and on higher releases of Oracle; and it can be used on Linux or UNIX Platforms. It has not been tested on Windows. An eAdam sample output is available at this Dropbox location; after downloading the sample output, look for the 0001_eadam36_N_dbname_index.html file and start browsing. Download the tool, uncompress the master ZIP file, and look for file eadam-master/source_system/eadam_extract.sql. Review and execute this single and short script connecting to the source database as SYS or DBA. Locate the TAR file produced, and send it to the requestor. Be aware that the TAR file produced by the extraction process can be large, so be sure you execute this extract script from a directory with at least 10 GBs of free space. Common sizes of this TAR file range between 100 MBs and 1 GB. Execution time for this extraction process may exceed 1 hour, depending on the size of the Data Dictionary. Be sure you have both the eAdam tool (eadam-master.zip) and the TAR file produced on a source system. Your staging database can be of equal, higher or lower release level than the source, but equal or higher is recommended. The Platform can be the same or different. Create on the staging system a file directory available to Oracle for read and write. Most probably you want to create this directory connecting to OS as Oracle and create a new directory like /home/oracle/eadam-master. Put in there the content of the eadam-master.zip file. Create the eAdam repository on the staging database. This step is needed only one time. Follow instructions from the eadam_readme.txt. Basically you need to execute eadam-master/stage_system/eadam_install.sql connected as SYS. This script asks for 4 parameters: Tablespace names for permanent and temporary schema objects, and the username and password of the new eAdam account. For the username I recommend eadam, but you can use any valid name. Load the data contained in the TAR file into the database. To do this you need first to copy the TAR file into the eadam-master/stage_system sub-directory and execute next the stage_system/eadam_load.sql script while on the stage_system sub-directory, and connecting as SYS. This script asks for 4 parameters. Pass first the directory path of your stage_system sub-directory, for example /home/oracle/eadam-master/stage_system (this sub-directory must contain the TAR file). 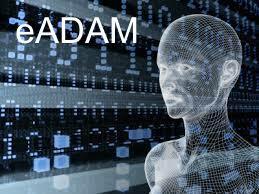 Pass next the username and password of your eadam account as you created them. Pass last the name of the TAR file to be loaded into the database. The load process performs some data transformations and it produces at the end an output similar to eDB360 but smaller in content. After you review the eAdam output, you may decide to generate new output for shorter time series, in such case use the eadam-master/stage_system/eadam_report.sql connecting as the eadam user. This reporting process asks for 3 parameters. Pass the EADAM_SEQ_ID which identifies your particular load (a list of values is displayed), then pass the range of dates using format YYYY-MM-DD/HH24:MI, for example 2014-07-27/17:33. EADAM @ GitHub is available as free software. You can see its eadam_readme.txt, license.txt or any other piece of the tool before downloading it. Use this link eadam-master.zip to actually download eAdam as a compressed file. Please post your feedback about this eAdam tool at this blog, or send and email directly to the tool author: Carlos Sierra. Enkitec’s free AWR data mining tool (eAdam) is now available! As of today, you can download this free tool out of our Enkitec‘s web page. Just select “eAdam” under the Products Tab. The next version of eAdam will incorporate the GV$views, equivalent to the currently extracted DBA_HIST set. The reason of this enhancement is to handle read-only databases (DataGuard – DG). So views like GV$ACTIVE_SESSION_HISTORY will be available for data mining within the eAdam staging repository. Any ways, I hope you enjoy this new tool. Feel free to provide constructive feedback on this blog, or by sending an email to carlos.sierra@enkitec.com.